A Kent seaside town is today alive with color after volunteers painted its drab gray steps with hues of pink, yellow, lime and violet. A local community group, Ramsgate Town Team, was inspired by a story in the Good News Network about a Turkish man painting dozens of steps in his hometown. After getting permission from the Thanet council, the team and its helpers worked together over a long weekend painting the Augusta Steps that lead down to their pristine beach. 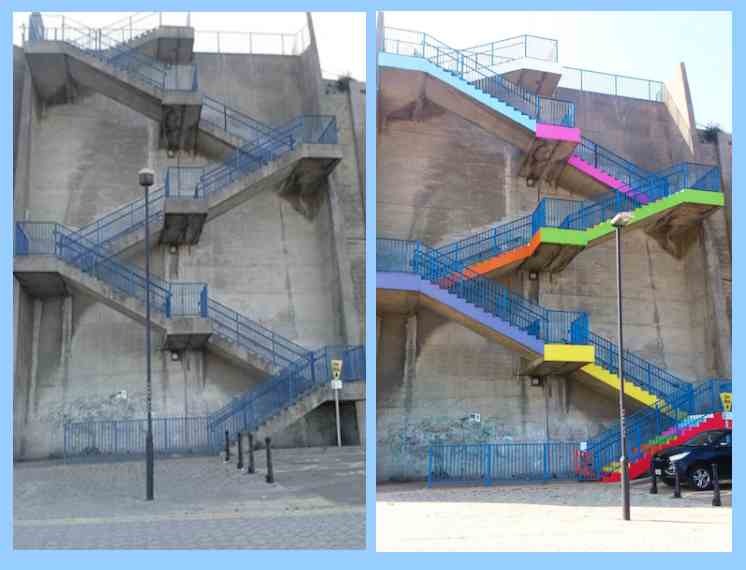 They gave each of the 120 steps a different hue, much like Mr. Huseyin Cetinel’s rainbow steps in Istanbul. Cetinel spent four days and $800 decorating a huge staircase in the town’s center. His story was hugely popular on social media and inspired Turks to start a kind of color uprising across the country. It spread to England too, as someone there saw the photo and story on the Good News Network . See the beautiful photos of their painting project on Facebook, here and various pics here, of the many volunteers. Read a local story in Promote-Ramsgate.com.